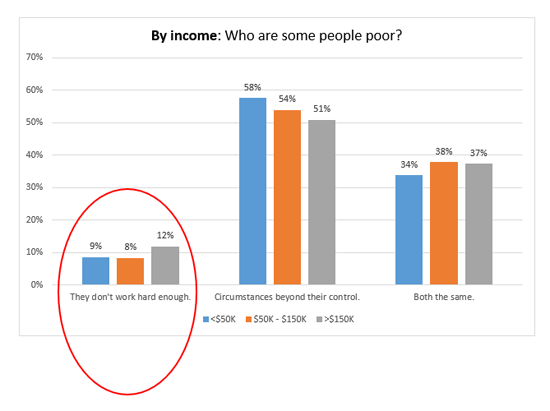 If we drill down deeper, we find that there is a significant difference in how members of our political parties view the question of why poor people are poor. Below is a comparative chart reflecting the responses of Republicans, Democrats and Independents. 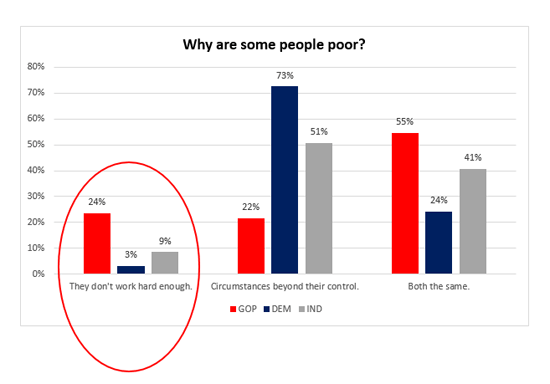 Republicans (in red) are eight times more likely than Democrats (in blue) to fault the poor for being poor (24% to 3% on the chart). However, this conclusion does not tell us why Republicans are so much more prone blame the poor. However, if we drill down further, we find that demographic factors are not nearly as important as political affiliation. 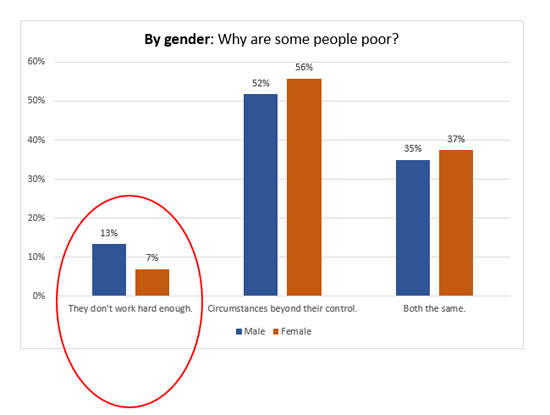 While men are nearly twice as likely as women to blame the poor, this is not nearly as pronounced as party affiliation. 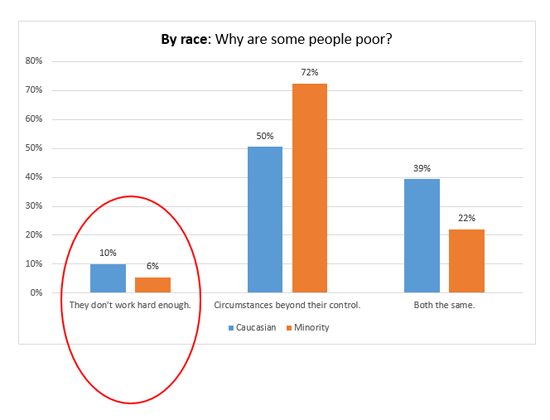 While minorities are less likely to blame the poor, the number is not nearly as statistically significant as party affiliation. Well then, what about the income level of the respondent? We looked at three levels of household income: (a) Less than $50,000 per year, (b) Between $50,000 and $150,000 per year and (c) Over $150,000 per year. 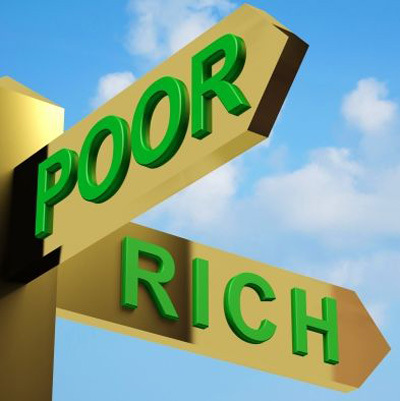 While the wealthiest of the three groups is most likely to fault the poor for being poor, it is not really statistically significant compared to the two other groups. Of the four variables we have examined, two might be considered “status offenses.” In other words, they have to do with a person’s status such as gender or race rather than anything that reflects the content of their character. 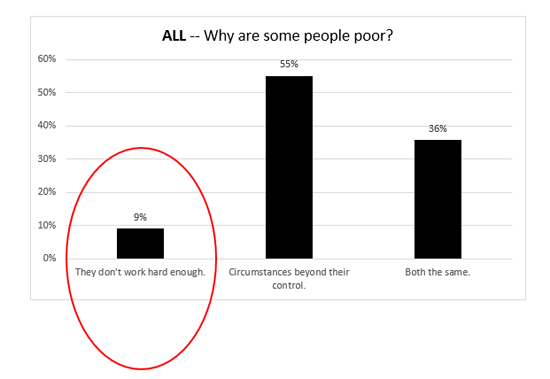 Those two variables do not seem to play a major role in determining how an individual views the question of why poor people are poor. The third variable is income. In one sense this variable should be disqualified because it implies a self-fulfilling prophesy: that your income level would reflect how you feel about why some people are at your income level and others aren’t. Whether the prophesy is at work or not, we find that these are no significant differences in responses by income level. The final variable is party affiliation. It is important to note that these affiliations are not “status offenses” like gender and race. They reflect a choice that an individual has made. In fact, of the four variables, it is the only one that is a choice because contrary to what a few believe, people do not choose their income levels. Political party is largely a choice. It’s different from religion where some people do not have the freedom to change allegiances and others do not avail themselves of that opportunity (including freedom from religion). As we see the clear differences between Republicans and Democrats on the question of why some people are poor while others are not, we are still at somewhat of a loss as to why or how the brains operate differently. This is a phenomenon that behavior scientists are studying. We hope to contribute to their body of knowledge. *Occasional Planet interviewed 550 Americans on January 14-15, 2016, using the services of the online-site Survey Monkey. The sample size is reliable +/- 4.5%, 95% of the time. It is demographically balanced by gender, ethnicity, age, income and geographic region.